SUMMER 2019 • REGISTRATION NOW OPEN! 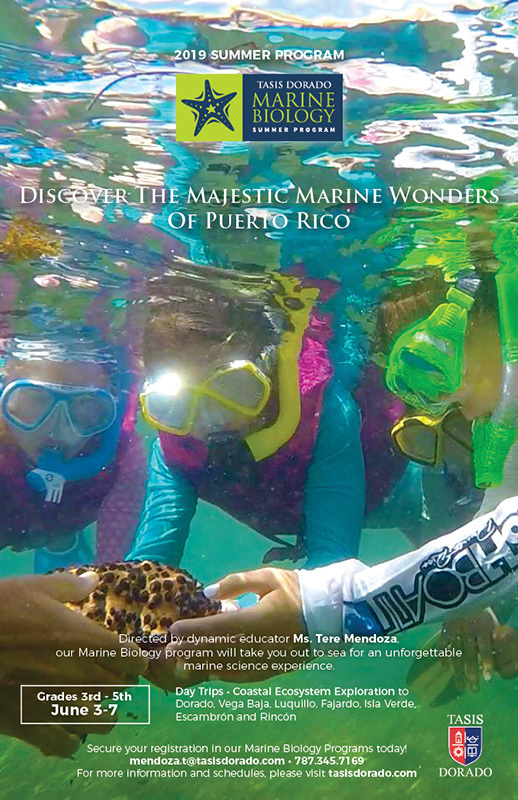 Discover The Majestic Marine Wonders Of Puerto Rico! *SPACE IS LIMITED TO 16 STUDENTS. ENROLL TODAY! TASIS DORADO MARINE BIOLOGY SUMMER PROGRAM is a one-week program for students currently in grades 3 - 5. The program is focused on exploring the organisms of our coastal ecosystems. Students will complete fish counts of the reef, seagrass surveys, and study the biodiversity of our coastal reefs. Students will snorkel and swim, as well as work in the Marine Biology Program Laboratory at the University of Puerto Rico. Directed by dynamic educator Ms. Tere Mendoza, our Marine Biology program will take you out to sea for an unforgettable marine science experience! REQUIREMENTS: Students must know how to swim. Space is limited! First come, first serve basis.